Local Athens eateries help build their community … literally! You can’t build a house without power. At Athens Area Habitat, we power our tools with electricity, and we power our crew and volunteers with excellent food catered by Athens area restaurants. 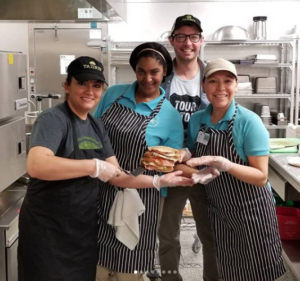 As part of the Great Chain of Life, which you might remember from your school days, a sandwich is prepared at a local restaurant, which is eaten by a crew member providing energy for swinging hammers and sawing wood and painting walls, which creates a home that a family can call their own for the first time. Through our Build an Appetite program, this cycle repeats itself throughout the year, transforming sandwiches, pita wraps, and plates of barbecue into energy, and energy into affordable housing. Just down Prince Avenue from Marti’s, in the Bottleworks building, is Taziki’s Mediterranean Cafe. Although there are several Taziki’s locations across the Southeast, each restaurant is locally focused, in much the same way as each Habitat affiliate “belongs” to the area it serves. 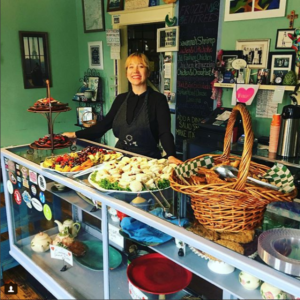 Founded by self-proclaimed “big-hearted foodies committed to making an impact in the community”, Taziki’s is centered around “the feeling of family and friends around the table”. Taziki’s on Prince is also partnering with the Clarke County School District to implement a program for students with disabilities to help grow herbs for the restaurant. It’s that kind of local outreach that makes Taziki’s a perfect partner for our Build an Appetite program. 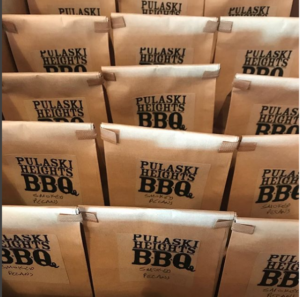 Just a quick hop, skip, and jump over to Pulaski Street leads us to our third Build an Appetite program charter partner, Pulaski Heights BBQ. Located in the historic 1920’s era Leathers building — that would be the same Leathers who invented the machine that makes Moon Pies — PHBBQ has been smoking their barbecue daily since 2012. In fact, when the wind is right, we can smell the hickory pit from our offices on Barber Street! When PHBBQ’s smokehouse went up in flames on Thanksgiving of 2016, we were devastated and helped get the word out that they were still serving and needed folks to come in so they wouldn’t go broke while recovering. Local response was strong, and we’re happy to say that Pulaski Heights is still around and better than ever. We think the barbecue-eating grin on Ben’s face in the photo at the top of this article pretty much says it all. It’s been a year now since Build an Appetite got off the ground, and in that time our charter partners have made a lot of volunteers happy. And in the process, they have literally fueled the work that goes into building and renovating homes for families who otherwise would have no home of their own. Thanks again to Marti’s, Taziki’s, and Pulaski Heights — you make our workdays, and our lives, richer by your service. If you’re a restaurant owner interested in participating in the Athens Area Habitat Build an Appetite program, you may contact our outreach director, Bridget Sivewright, at outreach@athenshabitat.com or by calling 706-208-1001, option 2, option 1.